"The Americans were passing intel to the Israelis, hoping that they'd act fast to grab the artefacts as a cultural priority mainly to snub the Russians. They didn't know about the Stasi mole funnelling everything back to Moscow, or that their Damascus work was wide open. We had some agents in place throughout, but I didn't for a minute think we weren't compromised in some way or another. And my code N sources were feeding back whispers from the cultists that they'd got a solid lead on the origins of the pieces and were getting ready to move. The whole thing was a murky mess, and I needed to clean it up. The only thing I knew for sure was that we needed to neutralise half a dozen people in the next 24 hours... but who?" Unique new trust mechanic, building on the Call of Cthulhu 7th Edition rules. Tips on tradecraft, running operations, special equipment, cults and Mythos entities. 26 detailed intelligence theatres, from Berlin to Malaysia, with plot hooks and scenario seeds. A complete, Istanbul-based sandbox campaign: Intersections. Connects to World War Cthulhu: The Darkest Hour. Packed with impossible choices, paranoia and mind-breaking horror. 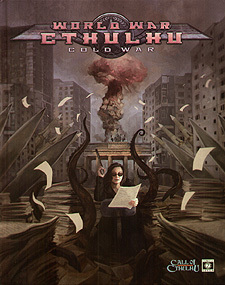 World War Cthulhu: Cold War is a setting for Call of Cthulhu 7th Edition, with conversion notes for earlier editions. You will need a copy of Chaosium's Call of Cthulhu Rulebook to play.